A. Smith, Institute of Astronomy, Cambridge. Astronomers have identified a young star, located almost 11,000 light years away, which could help us understand how the most massive stars in the Universe are formed. This young star, already more than 30 times the mass of our Sun, is still in the process of gathering material from its parent molecular cloud, and may be even more massive when it finally reaches adulthood. The researchers, led by a team at the University of Cambridge, have identified a key stage in the birth of a very massive star, and found that these stars form in a similar way to much smaller stars like our Sun - from a rotating disc of gas and dust. The results will be presented this week at the Star Formation 2016 conference held at the University of Exeter, and are reported in the Monthly Notices of the Royal Astronomical Society. In our galaxy, massive young stars - those with a mass at least eight times greater than the Sun - are much more difficult to study than smaller stars. This is because they live fast and die young, making them rare among the 100 billion stars in the Milky Way, and on average, they are much further away. "An average star like our Sun is formed over a few million years, whereas massive stars are formed orders of magnitude faster -- around 100,000 years," said Dr John Ilee from Cambridge's Institute of Astronomy, the study's lead author. "These massive stars also burn through their fuel much more quickly, so they have shorter overall lifespans, making them harder to catch when they are infants." The protostar that Ilee and his colleagues identified resides in an infrared dark cloud - a very cold and dense region of space which makes for an ideal stellar nursery. However, this rich star-forming region is difficult to observe using conventional telescopes, since the young stars are surrounded by a thick, opaque cloud of gas and dust. But by using the Submillimeter Array (SMA) in Hawaii and the Karl G Jansky Very Large Array (VLA) in New Mexico, both of which use relatively long wavelengths of light to observe the sky, the researchers were able to 'see' through the cloud and into the stellar nursery itself. 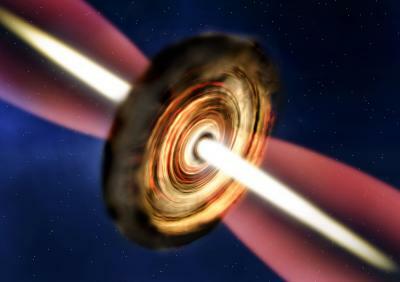 By measuring the amount of radiation emitted by cold dust near the star, and by using unique fingerprints of various different molecules in the gas, the researchers were able to determine the presence of a 'Keplerian' disc - one which rotates more quickly at its centre than at its edge. "This type of rotation is also seen in the Solar System - the inner planets rotate around the Sun more quickly than the outer planets," said Ilee. "It's exciting to find such a disc around a massive young star, because it suggests that massive stars form in a similar way to lower mass stars, like our Sun." The initial phases of this work were part of an undergraduate summer research project at the University of St Andrews, funded by the Royal Astronomical Society (RAS). The undergraduate carrying out the work, Pooneh Nazari, said, "My project involved an initial exploration of the observations, and writing a piece of software to 'weigh' the central star. I'm very grateful to the RAS for providing me with funding for the summer project -- I'd encourage anyone interested in academic research to try one!" From these observations, the team measured the mass of the protostar to be over 30 times the mass of the Sun. In addition, the disc surrounding the young star was also calculated to be relatively massive, between two and three times the mass of our Sun. Dr Duncan Forgan, also from St Andrews and lead author of a companion paper, said, "Our theoretical calculations suggest that the disc could in fact be hiding even more mass under layers of gas and dust. The disc may even be so massive that it can break up under its own gravity, forming a series of less massive companion protostars."